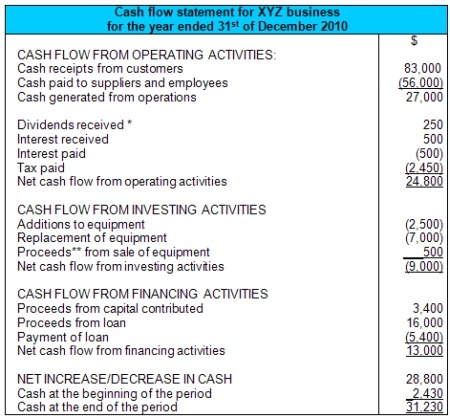 Q: Cash flow statement shows negative from operating activities but shows positive on cash at the end of the period. Is that possible? A: Yes, this is definitely possible. Cash flow from operating activities is usually positive and this would indicate that the business is successful in terms of the overall cash flow related to its operations (sales, services provided, etc.). Cash flow from investing activities is usually negative. 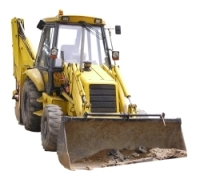 This is because the business in investing its cash, meaning it is spending on non-current assets, for example buying new machinery and equipment. But it can also include selling non-current assets for cash (i.e. positive cash flow). 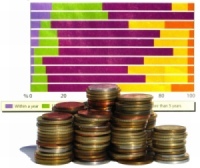 Cash flow from financing activities is usually positive. Financing basically means sourcing cash from somewhere - or the action of getting cash for the business. When a business receives cash it is positive for cash flow. But this category also includes paying back sources of cash, such as repaying a loan or repaying an investor. A key point is that each of these three categories can be negative or positive for cash flow. For example, cash flow from operating activities could be negative as the business has not made so much cash sales but has a lot of cash expenses (e.g. 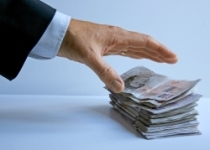 paying suppliers in cash). Or in terms of cash flow from financing activities, the business may have only repaid a loan (a source of cash in a previous year) and received no financing this year. So it would be negative cash flow from financing activities. In our question here where cash flow is negative for operating activities but overall is positive, it means the positive cash flow in the rest of the statement (from investing and financing activities) was greater than the negative cash flow from operating activities. What may have happened here is the business either sold non-current assets for a lot of cash or it received a lot of cash from financing (cash from a loan or from an investor), or both of these things occurred. Possible to get positive cash balance. By having huge inflow through investing and financing activities it is possible to get the positive cash balance instead of negative operating inflow, because the cash flow statement doesn't only have one content of inflow (cash flow from operating), there are others too, namely investing and financing, so all these are taken into account when calculating the net cash flows and the balance.